This week my good friend and colleague, Councillor Brenda Warrington, will make history by becoming the first-ever female executive leader of Tameside Council. It’s certainly a landmark occasion tinged with a great deal of sadness. There’s only a vacancy, of course, because of the untimely passing of Kieran Quinn on Christmas Day. It was a contest for Leader that no one ever wanted, held in very difficult circumstances. It’s fair to say that Tameside today is a better place because of Kieran, and his legacy, and campaigning for a fairer deal for our borough will live on. Now I’ve known Brenda for a good number of years, and I know her to be a tireless local representative and feisty campaigner who has represented the Denton West Ward well for the past 16 years. It’s the Ward I also had the privilege of representing for 12 years and I acted as Brenda’s Agent when she first stood in 2002. We’ve worked together closely ever since. Brenda is more than a colleague, I’m proud she’s a close family friend. Her guidance and support helped in my eventual selection for the Labour parliamentary candidacy in Denton and Reddish, and then as my Agent, for me to become your Member of Parliament in 2005 and all elections since. Brenda will take lead of the Council at the same time that central government will have slashed Tameside’s grant by £200 million in the decade from 2010-2020: a huge hit, by any standards. And worse, as with every other Council across the country, the Tory Government has offered no extra money in their latest settlement and has now told Councils that they ‘can’ increase Council Tax if they need to. This is actually a regressive move for areas like Tameside where a 1% increase brings in just £700,000 extra. It’s just not fair. Fresh leadership does, however, allow a chance to reassess the priorities for the borough more widely. In difficult economic circumstances, and through no fault of the Council, new ideas and innovation will allow for an alternative approach for dealing with Tory austerity. 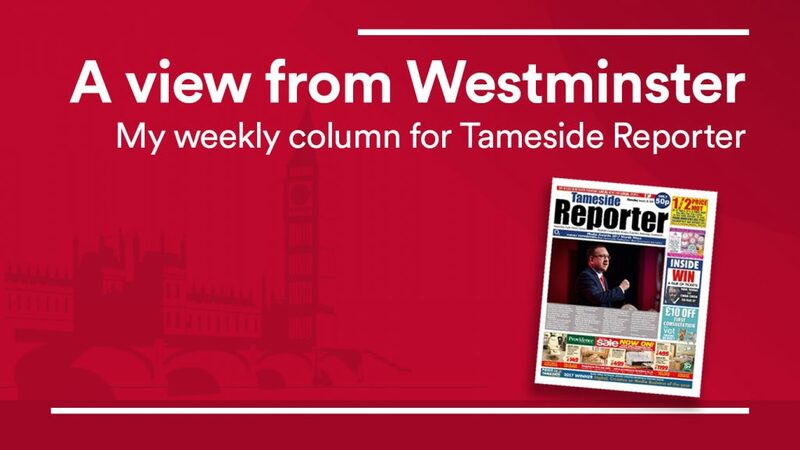 New leadership allows for fresh eyes and ideas for existing contentious issues such as the sale of urban greenspace, as well as the way in which Tameside amends its part of Greater Manchester Spatial Framework. Added to this Brenda will take on the continuing emerging challenges being faced by our underfunded Health and Social Care system as well as pressing issues like dealing with the collapse of Carillion. I am confident in Brenda’s ability, and I know she will offer a fresh and effective approach to tackling the issues Tameside faces. I wish her and the Council well. Difficult times certainly lie ahead, BUT they are exciting times, too, because I know the Council will be led by a passionate and devoted public servant: my friend, Brenda Warrington.